This month, Star Trek will be officially 50 years old. 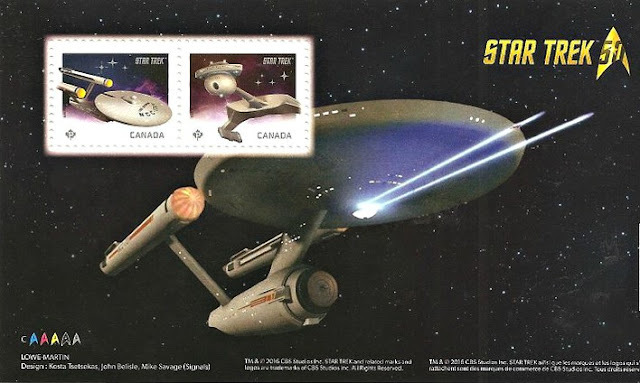 Earlier this year Canada Post put out a special commemorative set of stamps featuring five of the stars of the original series: Captain Kirk, Spock, McCoy, Scotty, and Klingon Commander Kor. Three of these men are Canadian born - William Shatner (Kirk), James Doohan (Scotty), and John Colicos (Kor). The other two are Leonard Nimoy (Spock) and DeForest Kelley (McCoy). 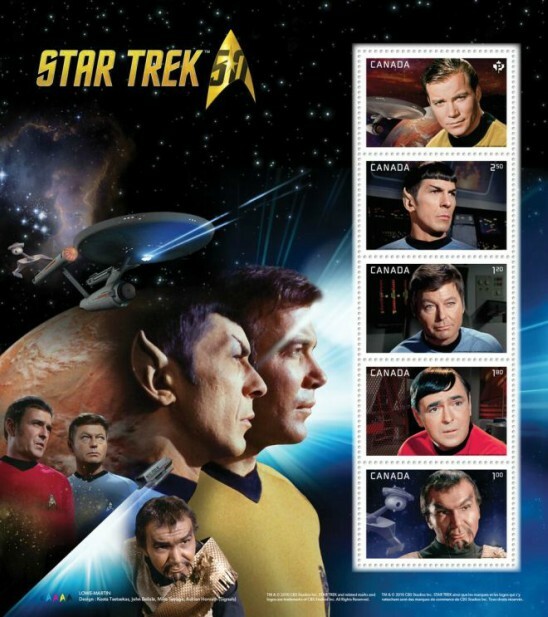 Why there are only five stamps and not, say, seven to include Sulu and Uhura is a mystery. And a huge oversight, in my (and many others) opinion. At the very least, every morning, afternoon, evening or late night, you should be able to find an episode of one of the Star Trek shows. Which does not disappoint this trekkie. And, in case you are not a trekkie and are wondering, William Shatner (age 85) is the only one of these five still alive. Although, the unrepresented Starfleet Command officers Nichelle Nichols, who played Lieutenant Uhura and George Takei, who was Sulu, are both also still very much alive. Chekov was also a regular - pity they didn't include him and the two you listed. I didn't realize the Canadian connection until this set came out. Yes, he was. And eight would have been a nice round number of stamps. And, Walter Koenig is also still very much alive. I'm so excited that Netflix will have Star Trek on its catalog by Jan 2017. I fervently hope that it will be in Singapore Netflix as we have very limited content here. Haven't really been acquainted with this show but has always been curious. Visiting from Sunday Stamps. Cheers! I hope you enjoy it when you do get the chance to watch. The original Star Trek series was great fun. I agree with you about the odd selection of characters to include on stamps. They skipped over a number of regulars to include Kor. All characters included are men! Uhura should have been there, so should Sulu. I thought I read somewhere that there was to be another series, but that never happened. I was sent some of these these year from Jo in Canada. She saves up stamps she gets for me as a result of reading my Sunday Stamp blogs. Happy to see that Sunday Stamps has had such a positive outcome! As a young man I was a loyal fan. I watched every Thursday at 8 p.m. There was a marathon of the original series on yesterday. yes, I stayed in and watched!